Our Saturday began with a lengthy drive from Medulin to Biograd. The journey was supposed to take around four and a half hours, but the actual time was closer to seven courtesy of a two hour tailback leading to the toll gate at the U&ccaron;ka Tunnel. We had allowed ourselves plenty of time, though the delay put the kibosh on my planned lunch stop, forcing us to forage in Megan's omnipresent bag of random snack foods. Those retracing our steps may want to consider flying between Pula and Zadar, a thirty-five minute journey that almost certainly costs less than driving; a ferry crossing is also available in peak season. Mirnovec Pirotehnika is a privately held company set up in 1993 that specialises in the design and manufacturing of professional grade fireworks. The core business has many well-known clients, including the Rolling Stones, David Bowie, Steven Spielberg, and Metallica. Consumer products are also offered through a network of almost one hundred and fifty stores throughout Croatia. When the company decided to open its first theme park in 2017 the decision to draw in customers using the existing brand was a logical one, but the lack of a location in the name made it harder to advertise. 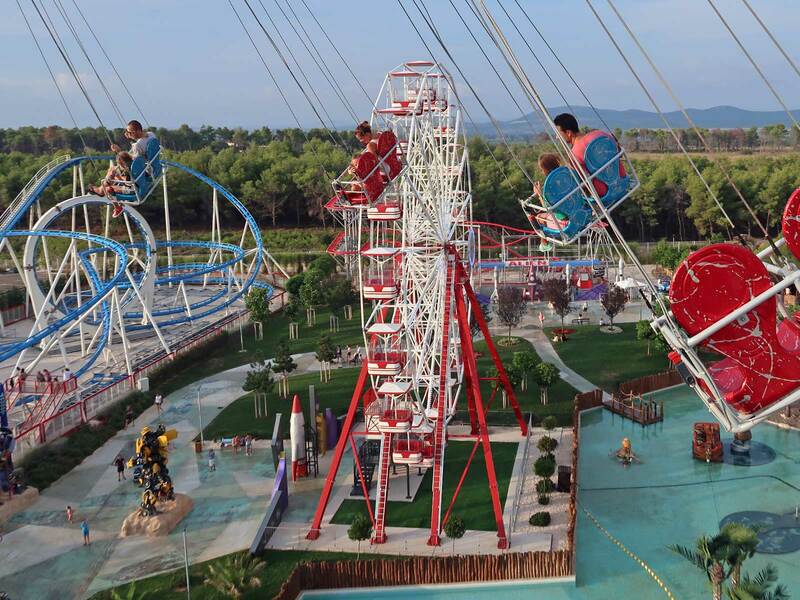 As a result it rebranded to Fun Park Biograd by Mirnovec at the start of this season. The park features over thirty attractions divided into three themed zones: The Old City, The Far West, and Mirnovec World. Much of the ride hardware has been sourced from Italian manufacturer SBF Visa, though there are a number of Chinese imports in the mix as well as a Sky Flyer manufactured in Slovakia. 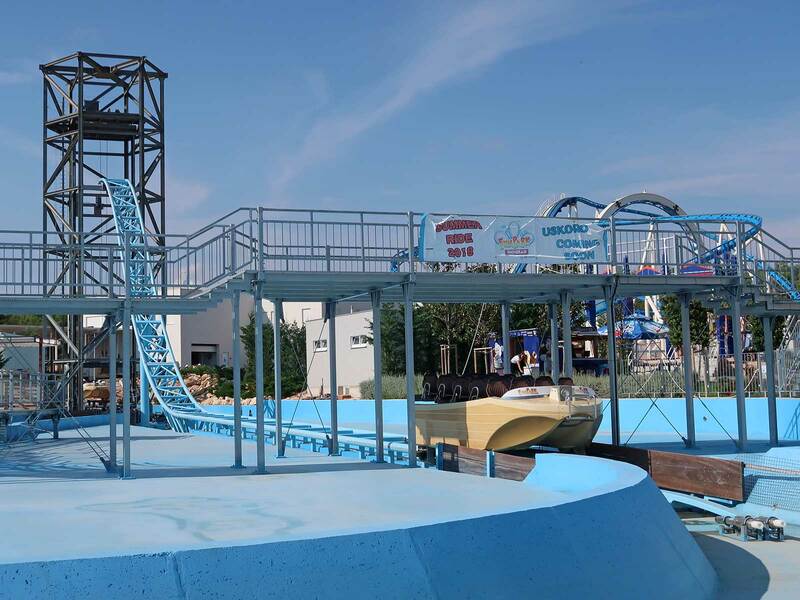 Today all of the attractions were operational apart from Atlantis, a splashdown ride with a vertical lift that was seen in pieces at the park site as early as March 2017 and under construction later the same year. Though the track and structure was physically complete it looked to me like testing had yet to get underway, and on that basis it seems unlikely that it will open in 2018 despite what the banners hanging from it say. The jewel in the collection is Big Blue, a thirty-something year old Schwarzkopf Silberpfeil with a long and varied history. Its first recorded park appearance was at OK Corral in the mid-eighties, though it may well have appeared at fairs first given its transportable status. Over the next three decades it spent time at four different UK parks, before disappearing from public view with the demise of Loudoun Castle at the end of 2010. Since then it has been repainted and restored to as-new condition, and as a result the average visitor would never realise its second hand status. The only vague hint is the old name of "Twist and Shout" on the back of the train, though this would likely be considered theming in a part of the world where English words are often used for ride decorations. The entrance queue is within the superstructure of the ride, starting with a footbridge above the brake run and continuing parallel to the first of two helices. Boarding guests stand within feet of the track at one of the fastest points in the layout, which helps to build excitement. The train retains its simple lap bar restraints, and unlike the other recent refurbishment it hasn't been retrofitted with supplemental seat belts. Most importantly of all, the ride retains the trademark Schwarzkopf smoothness and intensity in all seats of the train. We tried a number of different locations over the course of our visit, and eventually settled on back as our favourite. 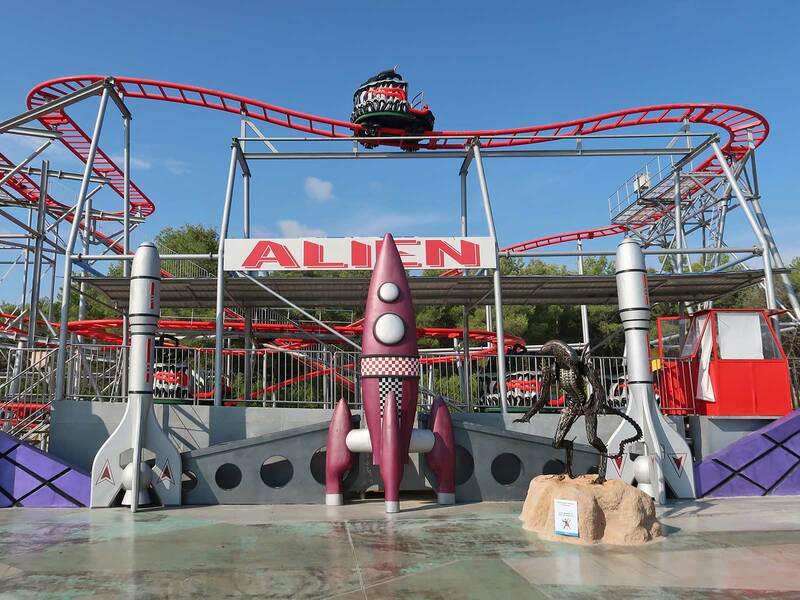 Our second stop was at Alien (#2498), a Chinese knock-off of the spinning mouse popularised by Reverchon in the late nineties. From a distance the copy looks authentic, but up close it becomes apparent that the two half decent drops found on the original models have been replaced with shallow descents that go no more than twenty degrees off the horizontal. My guess is that the track may have been fabricated this way both to reduce stresses on the structure and to allow for simplified wheel bogies on the cars; whatever the case the result looks like something designed in Roller Coaster Tycoon. Nevertheless the design has been relatively successful for Beijing Jiuhua, with a total of twenty-six known examples worldwide as of this writing. Enthusiasts will be well aware that these rides are at their best with unbalanced cars, and it was great to see the operators actively encouraging people to load heaviest people on the left hand side. The station had a balance sensor that would ordinarily have prevented dispatch, but a member of staff was leaning on the near side of the car until the appropriate light came on. The result was a remarkably good ride that featured both smooth tracking and powerful spinning. We decided to go back for a second lap later in our day, something that we almost never want to do on coasters manufactured in China. Our third and final tick was the imaginatively named Mine Train Coaster (#2499), our second non-spinning figure eight ride in as many months. The sixteen seats on the themed train were filled entirely with adults, something we'd never have expected outside of a coaster club event, and though the tyre drives struggled to lift the weight up the first hill they had no trouble maintaining motion once we were moving. As ever with such rides the train had a tenuous relationship with the rails, clattering and rocking a little as it went around corners, but the low top speed ensured that the awkward tracking had no impact on the comfort level. The star attraction in the park is Captain Hook's House of Horror, an elaborate walkthrough with a variety of evil animatronics that for the most part are not hidden behind safety grilles. The first room had a number of skeletons grabbing at guests through holes in the wall, and we saw a number of younger visitors aborting their experience right there. In the next room a painting of the eponymous captain fell away as we approached to reveal a zombie shaking at its restraining chains. Further exploration revealed skeletons, spiders, and blood-soaked animatronics whose sound effects made it quite clear that they were definitely not happy. Other rooms featured a dismembered white female body with prominent cleavage on a dining table, a laundrette with body parts and Mirnovec t-shirts, and a graveyard with tombstones for Jack Sparrow, Elisabeth Swann, and Will Turner. We were pretty hungry at this point, and decided that we'd look for something in the park restaurant rather than waiting until the airport. This was definitely the right call; though Split Airport will have a new terminal in the near future passengers are currently being handled through a badly overcrowded shed dating from the late seventies that would be embarrassing for a third world country. Our selections were prepared on the spot rather than taken from a heat lamp, and though they were definitely not Michelin Star level they were more than adequate for the price. Our table next to the entrance door gave us a view of the park's performance stage, where an industrial-sized bubble machine had just been set in motion. Over the course of the next few minutes a wide area was covered in about twelve inches of soap foam, and we watched bemused as at least fifty children danced in its midst to the accompaniment of assorted party music. Our last major hits were the Adria Eye wheel and the Sky Flyer for overhead photography, and though we probably should have done both before the sun started to set we nevertheless managed a number of good pictures. We also passed a few minutes on Animal Kingdom, a SBF antique cars ride that had no animals whatsoever, though it did have a wide variety of animatronic dinosaurs and assorted theming; I'm guessing that the powers that be decided to change the ride theme part way through construction but never got round to altering the signage.